Shown here is the inscription printed on the reverse side of the small plate. 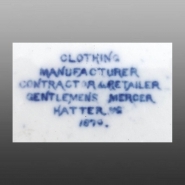 The inscription dates the piece and reads: "Clothing Manufacturer, Contractor & Retailer, Gentlemen's Mercer, Hatter c.1879." A miniature earthenware plate printed in dark blue with the Standard Willow pattern. This small plate was made as a trade card for the Newcastle retailer Richard Stanway. On the front the pattern is overwritten by a scroll with the inscription: "RICHARD STANWAY, NEWCASTLE STAFFS." A small hole at the top edge suggests that it may have been attached to garments made by the retailer as a novel form of labeling. Other small plates of similar design were used by Callard & Callard and by John Mortlock.